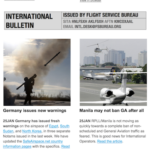 Every Wednesday, Flight Service Bureau issues a weekly International Ops Bulletin for International Pilots, Dispatchers, ATC, Regulators, Authorities, Airlines and Aircraft Operators. We cover this weeks changes to International Flight Operations – Airports, ATC, Procedures, New rules, Visas, Airspace alerts, Weather issues, and warnings and dangers to international aviation. Through OpsGroup and regular bulletin subscribers, we reach 40,000 people each week. A short, free version is available here – usually delivered once a fortnight. Sample? Take a look at one. You can request membership of OPSGROUP to receive the full version delivered every Wednesday, along with all OPSGROUP member benefits: Members Questions, Group Discussions, Free maps and charts (normally $25), Full access to aireport for group reviews of handlers and airports, regular alerts for critical international ops info, Complimentary Airports Database (normally $375), Full access to safeairspace.net including updated risk alerts, and guidance and help when you want it on any International Operations topic (that last one is really useful!). If you’re not sure yet, just have a look around this blog and you’ll get an idea of the type of thing you’ll get as a member – some of the content is posted publicly. Or ask us a question about OPSGROUP.